Cleaning the bathroom can be a major hassle, but it doesn’t have to be! 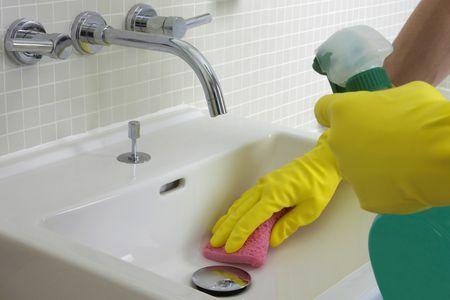 We have an awesome process you can use to give your bathroom a thorough deep cleaning in less than an hour. Let’s go clean your bathroom! What products you need to clean your bathroom? There are plenty of different products you can use to get the job done, but we will post some of the essentials. When it comes to the bathroom you will be dealing with a mirror and possibly a glass shower door. Theses two areas require a higher quality microfiber towel to buff, so make sure you have a few. You will need all purpose cleaner for the counter areas, shower, possibly floor and whatever areas you might need to sanitize. You can also use your all purpose cleaner for the mirror and the glass shower door, but we recommend using a specialty product such as Rain X in order to save time. Make sure to let the stainless steel polish sit on the surface being cleaned if it has hard water build up. After you get rid of all the hard water stains you can buff it out with a clean microfiber. Obviously you will need a vacuum to get all the hair off the floors. You can also utilize the wand on your vacuum to get loose hair out of the shower/tub before getting it wet. The wand also serves useful for getting areas like behind the toilet and inside cabinets and drawers if necessary. After everything else is done and the floor is vacuumed 100% — it’s time to mop. We highly recommend a flat mop and pre wet the mop head. When the mop head is ready to go, we take our thieves cleaner (or other good floor cleaner) spray the floor and away we go. Make sure you take your time when you mop. A good mop job really puts the cherry on top of a good bathroom cleaning. Are you ready to clean your bathroom? Alright, we have all the necessary products and we know what they will be used for, but what order do we clean in? First and foremost, we always start top to bottom. That means, you always start with dusting any cobwebs or light fixtures. Clear off the counter area and clean that mirror. Wipe off counter top and put items back in an organized manner. Dry wipe toilet/wet wipe toilet/dry toilet and clean the inside of the toilet. Make sure to wipe the outside of the toilet as well. Remove products from the shower/tub and dry wipe the base. Spray down walls/base with all purpose and stainless steel with your specialty cleaner. Vacuum the floors, mop and you are done! Hopefully you can get your bathroom looking great by following our simple bathroom cleaning process. As always, if you are in the Dallas area — you can always book a home cleaning with Maids 2 Match Maid Service!